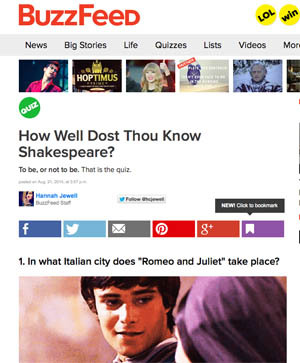 Is no one reading the Internet any more? Your reading is interrupted, you start wondering how much of the rest of the piece is gobbledegook, and your favourite magazine’s online presence has potentially just lost itself another reader. I’m getting to the point where I find too much of what’s written online all but impossible to read, thanks to the endless literals, misused words (because the writer thinks impressive-sounding words make the piece look important, irrespective of what they actually mean), clear evidence of lack of understanding of the subject, and ideas lovingly ripped off from another online source presented as news or the writer’s own opinion. OK, Cyberdyne Systems T-1000, thanks for that insight into your background and attire – now how about the product? And we’re not talking bedroom bloggers here, but websites from print titles by major publishing companies, repeatedly delivering writing far removed from anything able to pass muster as good journalism. OK, a declaration of interest before we go any further: I have a degree in English, and long ago and far, far away – and purely by an alphabetical quirk – shared tutorial sessions with someone rather more famous than I who now presents a long-running radio series on the English language. Thought you might find that Quite Interesting, but – despite that background – this isn’t a fogeyish rant about flouted rules of grammar: after all, a couple of pars back I started not just a sentence but an entire paragraph with a conjunction. It’s the Internet: we don’t need subs; we don’t need anyone to read the copy before it’s published – it’s instant, it’s happening, it’s now. Quality? What quality? What I learned all those years ago in those college sessions – in which we discussed a topic, two students to one teacher, and then went away and wrote essays we were expected to read at the next meeting – was that it wasn’t enough just to write something with all the relevant facts crammed in. What was required was the ability to write persuasively, grab the reader by the lapels and make them want to follow whatever you had written. This was a long time before any of us was obsessed with the idea of building up a following, and while I have to admit to no formal journalistic training, the lessons to be learned in building an argument, and writing compelling copy, were obvious even back then. Good writing is addictive: it makes the reader want more, can lead you off in unexpected directions, can make even an airport paperback all but impossible to put down until you have reached its conclusion. If you’ve ever started a book and found yourself still reading at 2AM, you’ve encountered good writing: it may not be a work universally acknowledged as a literary masterpiece, but it’s certainly done its job – and the chances are when you’ve finished it you’ll be seeking out more by the same writer. Yet ‘writing’ isn’t what’s happening in so many Internet outlets: quite apart from the shackles of a ‘clickbait’ headline, promising much when the writing doesn’t actually have a lot to say, too much of what’s out there is either all but copied from another equally poorly written source, or lifted piecemeal from a press release. Piffle, all of it, and all about getting the right keywords in place (a hangover from the days when keywords did the trick) to ensure high placement on Google search pages, and thus more reader clicks, and thus more page views to sell to potential advertisers. It’s pure ‘tail wagging the dog’ publishing, almost to the point where it doesn’t matter what’s actually on the page to which readers have been lured by the search ranking: once they’ve clicked, and they’re there, numbers crunch, and they can then bugger off (or preferably click through to another equally uninformative page) for all the site publisher cares. No need for any original content, no need for any thought: get the office junior to do a bit of Googling (ironic, huh? ), come up with ten things that’ll make a list, and steal the pictures from Google image search (if they’re lucky, the copyright holder might get a desultory ‘via’ credit). Slap on a clumsy but search-friendly headline – 10 crisps to eat when watching the Premier League 2014-15 or some such nonsense – and job, as they say, is a good ‘un. And if you think I’m exaggerating about the almost verbatim republishing of press releases, just read a few stories and try punting the odd sentence into Google – it works best with something describing the product in some detail. Bet you’ll find the same sentence appearing in multiple ‘news stories’. I read somewhere the other week that in the States there are 4.6 PR specialists for every journalist. That’s hardly a surprise when they can generate endless ‘survey’ or ‘report’ stories all ready-packaged to be snapped up by the endlessly hungry monster that is the Internet, and its ‘doesn’t matter if it’s crap – it’s new, and we can get a click-friendly headline out of it’ way of thinking. No thinking, no analysis, no insight – slap it up on the site and watch those clicks roll in. So where are the sub-editors, toiling to hone the copy and make it truly involving? Nah, don’t need them – nobody reads this stuff beyond the summary panels and crossheads anyway. Readable, right? I was reminded of that when watching a Sky Arts programme the other night about lyricist Don Black – Born Free, Tell Me On A Sunday, all those Bond themes –, in which composer David Arnold said Black’s real talent was in writing lines that sang really well. All kinds of people could write lyrics, he said, but Black’s talent was in creating a song that was not only easy to sing, but sounded natural, too. It was an eye-opener to me all those years back that pieces by some of my writing heroes of the time – highly respected authors on what wasn’t yet being called ‘consumer technology’ – were dog-rough when they came into the office. What I’d actually been enjoying was the work of some very good sub-editors, the written equivalent of using auto-tuning to create the illusion that the star of the moment can actually sing. Yes, there is good writing out there, but so little of it does anything to spark the reader’s enthusiasm for a subject or convey the passion of the writer, and too much is saddled with clumsy efforts to inject style. In a market sector driven by those wanting to learn, or to feed their enthusiasm, that’s pretty tragic – and it doesn’t have to be that way. 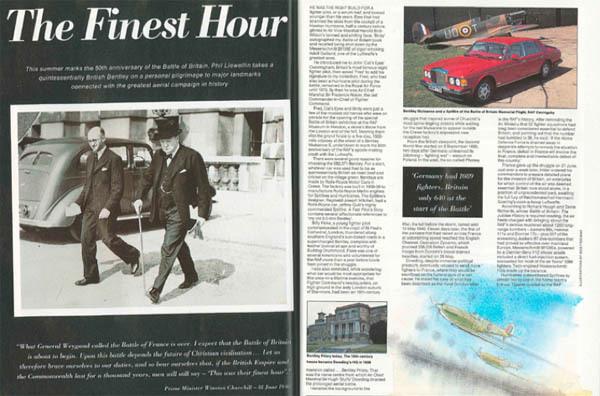 For examples of some of the good stuff, for skilled writers at ease with their words and with something to say to their readers, have a look at some of the archive pieces published by Car magazine as part of its 50th anniversary, especially this 1990 piece (above) marking the 50th anniversary of the Battle of Britain (and a Bentley) by the late Phil Llewellin, or the piece below by Alexei Sayle driving the Rover 75 in 1999. It’s confident, entertaining writing, involving the reader in its subject, even if the online versions aren’t without their own examples of the ‘Online? Who needs subs?’ syndrome, which is a shame. Yes, perhaps it seems like something from a bygone age when viewed from the quick-hit, click-friendly TwentyTeens, but it’s something you want to read, to enjoy. Well, I do, anyway. Maybe that’s where we’ve gone wrong; maybe, while we bemoan the shift of the buying public away from enthusiast products, be they hi-fi or cameras or whatever, we should be looking inwards a bit, and wondering whether we’ve thrown the enthusiasm away in the hunt for more content – webspeak for ‘writing’ –, delivered as fast as possible. As a teenager I was first ensnared into an interest in cameras and hi-fi and even early computers by the writings of enthusiastic reviewers, willing to spend the time and put in the work to understand and enjoy whatever they were writing about, and pass on that insight and enthusiasm to their readers. Or, as I soon realised, enthusiastic reviewers doing it more or less for love (then, as now, no-one in their right mind does this for the money) and very good subs who were equally knowledgeable about what made a good read as they were on the subject in question. And the need to hone an article before publication has stayed with me. It was with no little relief that I long ago got off the ‘ten pairs of speakers by Thursday’ reviewing production line, realising that to do a product justice it was necessary to spend time with it, live with it as a consumer would, get an angle on it, think it through, and form an opinion. Only then will I start committing words to screen. When it’s done I save it, go back the next morning (or at least after a cup of tea), re-read the piece, look at ways it can be improved, tune it a bit – and then finally hit the ‘send’ button. After all – and I think this logic makes sense – if a team of designers has spent the past year developing, engineering and fine-tuning a product, surely it deserves more than a day (if they’re lucky) of attention, and a careful consideration of what’s written about it (good or bad), before an opinion is delivered, ripped off and repeated all over the Internet, to the point that it becomes set in stone. I really love the stuff I write about – yes, after all these years – and when I am really enjoying something I’ll do everything I can to try to share that enthusiasm with anyone happening to stumble across this site, or any of my printed work. If that takes three or four rewrites before the copy hits the screen, then so be it. Yes, perhaps I am succumbing to early-onset curmudgeonliness, but it seems to me the same kind of thinking that has all but snuffed out the idea of enjoying a well-constructed album in favour of just buying a few tracks – thanks, iTunes, for turning everything into ‘songs’ – is in danger of eventually turning all writing into no more than McNugget-like ‘listicles’. Why? Could it really be that in this busy world no one has any time to read more than a couple of hundred words? I doubt it: after all, what happened to all that extra leisure-time technology was supposed to give us? Perhaps – although I really hope this isn’t so – it’s just symptomatic of a general decline in interest in reading and the language. Great post Andrew, demonstrating your own extraordinary skills with words, reminding us all that quality matters. The way you turn a phrase is how Astaire turned a dance step, effortless. Ain’t it the truth. I did gasp at the review you mentioned earlier in the week – apparently very junior reviewing entirely unsubbed/checked. Is that a systems failure, or short staffing, an editor too shy to hand work back, or what? I am entirely with you on this and like to think am an actual “writer”. I have been known to make readers experience an emotional response.